PraiseTracks » IK Multimedia Syntronik Now Shipping! IK Multimedia Syntronik Now Shipping! July 20, 2017 – IK Multimedia is proud to announce that Syntronik, the legendary synth powerhouse for Mac® and PC, is now shipping worldwide. To accurately reproduce the real sound of vintage synthesizers sampling their sound-generating oscillators is the only way to ensure truly authentic results. 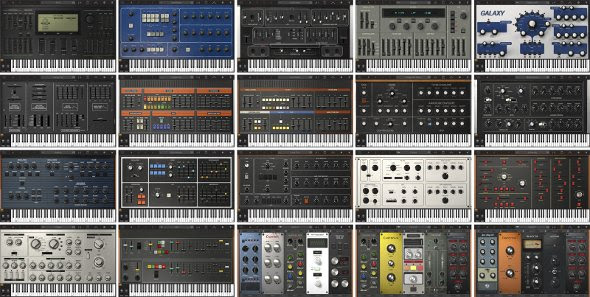 Each of the 38 synths in Syntronik was meticulously multi-sampled using the most advanced techniques available, creating a library of over 50GB and 70,000 samples. Adding even greater realism, the proprietary DRIFT technology in Syntronik varies the phase, color and pitch of the sampled oscillators in a subtle fashion to keep them moving just like real analog oscillators. Much more than simple detuning or even multiple-source modulation, DRIFT faithfully reproduces the behavior of oscillators from real hardware synths. Syntronik’s unique hybrid synthesis engine reaches far beyond the limits of traditional sampling thanks to a brand new analog modeled filter section built with the experience and know-how from IK, the company that pioneered virtual circuit modeling. Syntronik offers 7 filter types including 4 of the best sounding analog filters of all time: the Moog transistor ladder, Roland’s IR3109 chip, the famous Curtis CEM3320 chip and the Oberheim SEM state variable filter. This allows for pristine reproduction of the most critical section of every synthesizer. Syntronik also provides a Classic low-pass filter and powerful digital filters like Formant and Phase that can take the analog source oscillators into a whole new world of sonic possibilities. Plus, all 7 filters can be selected within each included instrument, enabling users to mix and match them at will – like using a Moog filter with Oberheim oscillators – for unique combinations never heard before. Also included in Syntronik is a full suite of 38 professional effects with a lunch-box style configuration that is unmatched in the world of virtual instruments, along with advanced features like 4-part layers, splits and arpeggiators. This makes Syntronik the ultimate source of inspiration with a huge array of synthesizer sounds ranging from exact recreations true to the originals to completely unique sounds ready to cover productions in any genre and style. Syntronik’s sounds can be opened seamlessly in SampleTank 3 (with the version 3.7 update available from the IK Multimedia website), allowing them to be used individually or as 4-part instruments together with the vast and continually expanding range of instruments available in the SampleTank library. The SampleTank version 3.7 update includes new features such as the Channel Strip and Ensemble Chorus effects as well as 6 new filter types, increasing the power and flexibility of the industry-standard sound and groove workstation for even greater creative possibilities. Syntronik Free is a great way to check out the superior sound quality and flexibility of the legendary synth powerhouse at no cost. In this version users can experience all 17 instruments with 50 available sounds including the full functionality of all controls, 38 effects, 4-part layers, splits and arpeggiators. Users who want to build their customized synth studio one instrument at a time can easily expand Syntronik Free via the built-in “In-App Shop“. Each of the 17 instruments, available separately, has full functionality and includes all the presets relating to the corresponding instrument from the collection library. Syntronik is available now from the IK Multimedia website and select music instrument retailers. Users with qualifying IK products* can crossgrade for as low as $199.99** via direct download or $229.99 for a boxed copy. New users can get Syntronik for as low as $299.99 via direct download or $329.99 for a boxed copy. Syntronik Free is available as a complimentary download from the IK Multimedia website and is expandable with Syntronik Instruments available individually via the built-in “In-App Shop” for $49.99 each. SampleTank version 3.7 update is available as a download from the IK Multimedia website.